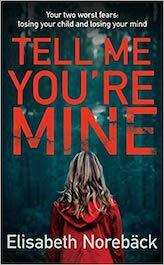 A debut novel from Stockholm author Elisabeth Norebäck, Tell Me You’re Mine is a long and interesting thriller, which bodes well for her future career and has already been sold for translation in 33 languages. Its central character is Stella, a physiotherapist. She has come to terms with the tragedy that has overhung her life but today brings a dramatic twist to it. A new patient has arrived, Isabelle, who catapults Stella into a terrifying nightmare. Is Isabelle her own long lost daughter Alice who disappeared twenty years earlier at the age of one? Stella convinces herself that this is indeed Alice, who everyone save her believed had been drowned. Although she is now happily married with a son, Milo, a loving husband, Henrik, and a rewarding career, Stella is driven with revived conviction that this new patient is indeed Alice, even though some years earlier she had mistakenly identified someone else as her long lost daughter. Now she has no doubts and risks everything in her quest to prove Alice has returned to her. But the road to the truth is far from simple and the further Stella goes the more danger looms. The pace of the thriller speeds up as the story progresses and becomes a compelling read as Stella breaks through to the true story of what happened to baby Alice.